Rapidly gentrifying neighborhood starts process towards landmark status. On July 24, 2007, Landmarks calendared a 15-block area on Brooklyn’s waterfront adjacent to the Manhattan Bridge approach as a potential historic district. 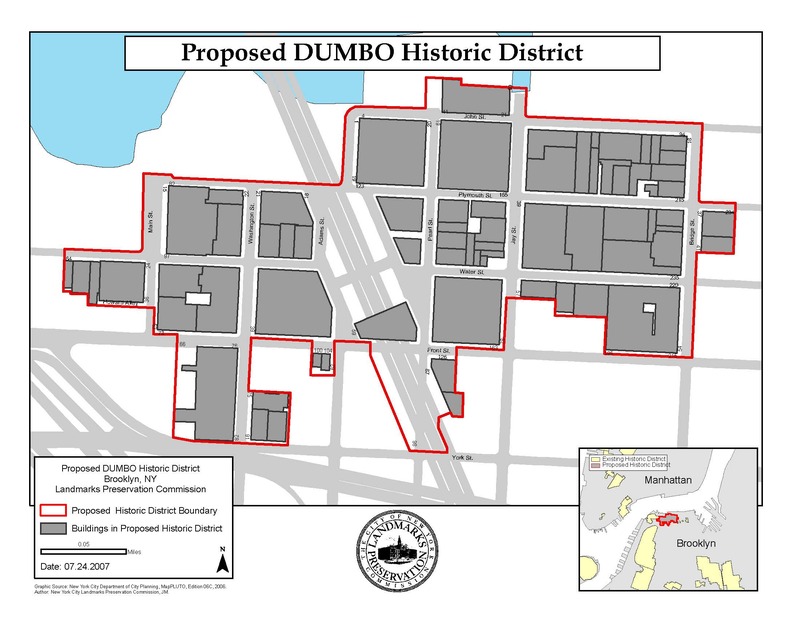 In the late nineteenth and early twentieth centuries, DUMBO developed as a primarily industrial area at a time when Brooklyn was counted among the country’s largest manufacturing centers. DUMBO’s East River location attracted a wide variety of industries, including coffee, paper and paint. Now no longer an industrial hub, developers have converted many of the former factory buildings into apartments and condominiums. LPC: DUMBO Historic District (LP- 2273) (July 24, 2007).